The Shire Community Living Library - call for Expressions of Interest to be a Living Book. Are you someone out of the ordinary? Do you know of a local whose story inspires you? Do you think others would benefit from hearing the tale? Then please let others know about it and consider becoming involved in The Shire Community Living Library. A Living Library works like any other library. Books are borrowed, returned when read and another book can be borrowed. The difference is that the Books are people. The conversations held as part of this project will take place in a controlled and safe environment in the Central Library at Sutherland. The activity is designed to build an understanding of difference, by exposure to people who have alternative life experiences, thereby encouraging the breaking down of barriers and prejudices within our community. Understanding of difference often comes from listening to the diverse points of view of others. Positive community outcomes are built upon a knowledge and understanding of all those with a stake in the community. Through this activity Readers of a Living Book will have the opportunity to hear these differing views in an accepting, controlled environment. The more people who have tangible relationships with, or at least feel they understand, a wide range of groups within a community, the better. The framework for this project originated in 2000 in Denmark at the Roskilde Festival, by the Danish youth NGO, Stop the Violence. It has since been adopted by the Directorate of Youth and Sport within the Council of Europe. It has been so successful that it has continued to be held at many festivals throughout Europe since. The concept was taken up by a librarian from the Malmo library in Sweden. Catherina Noren's efforts were noticed by one Andrew Denton of Enough Rope fame. You can read, listen to or watch that interview to get an idea of the purpose and the potential power of the Living Library. The first Living Library developed in Australia was held by Lismore Library in 2007. 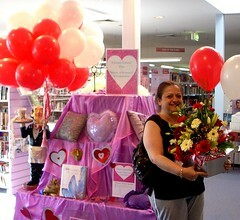 Lismore's Living Library day was so successful that the event is now running once a month. The Shire’s first event will take place in June 2008. Reader response will be evaluated and it is anticipated that, with a positive outcome subsequent events would be held on a monthly basis throughout the year. It is hoped that there will be a pool of books to draw on, so that each event will have a different mix of Titles for Readers to choose from. More information about the Living Library program can be obtained by telephoning Jacinta Craine at Sutherland Library on 9710 0351. If you are interested in becoming a Living Book, or know someone who you think would be, please complete a Living Library Expressions of Interest form. Completed forms can be returned to any branch library. Yes, it's that time again. Now that the school year is up and running we are starting to get a lot more inquiries in the Library regarding school and uni assignments. It's an opportune time to outline some of the services and resources that are available in the Library for students. Indeed, in some cases you don't even need to come to the Library - several of these resources can by accessed by Library Members from wherever they are via the Internet. Yourtutor is an online tutoring service. Yourtutor connects students with expert tutors for live, one-to-one individual learning sessions via the Internet in their Online Classroom. Library members can access this service from home and the best bit - it's absolutely free! Yourtutor is available for students in years 4-12 from Monday to Friday between 4pm and 8pm and subjects include Maths, English, Science, Assignment Research and Study Skills. The Library offers parents and students the opportunity to learn how to get the most out of the Library in our Project Busters workshops. These workshops include a tour of the library, a lesson in how to use the library catalogue and how to locate the information you find in the catalogue within the library, along with a range of other hints and tips. Doing the HSC in 2008? Sutherland Shire Libraries has a large collection of materials to support students who are studying for the HSC. We have an extensive collection of study guides, exam papers and other supplementary materials to help you prepare for your assessments and exams. If you want to know more then just ask us for a Library tour, which will help you make the best possible use of our collection and facilities. You all know that you can search the Library catalogue for books and other materials held in our collection, right? Well, did you know that the Library also offers you a range of Online Databases, which can help you find newspaper, magazine and journal articles. Need some newspaper articles on a recent event for a school assignment? Check out ANZ Newsstand. You search this database by keyword and download the full text from over 60 news sources in Australia and New Zealand, including the Sydney Morning Herald, the Australian, The Daily Telegraph and all the major daily newspapers in Australia, all from the convenience of your home or school computer. Maybe you need some criticism of Bruce Dawe's poetry for English? Try Austlit for some references. Writing an essay for a university subject? Academic Research Library, Masterfile and Australian Public Affairs have thousands of scholarly journals indexed covering all subjects. Our public access computers (booking fees apply) have Internet access and Microsoft Office - you can type up assignments, download lecture notes, check your email or do your research via the web. Got your own laptop? No problem, we have a wireless hotspot in Sutherland Library so you can access the Internet and do your assignments here where the resources are. All the advice about studying suggests you should take regular breaks and do some physical activity. Check out our collection of CDs and DVDs for some well earned time out. What about an Easy relaxation workout DVD to help you de-stress. Whatever your needs - the Library can help. We hope to see you in 2008. This is the key message of a two-week consumer fraud and scams awareness campaign organised by the Australasian Consumer Fraud Taskforce. On February 24 Fraud Fortnight will be launched in Australia and New Zealand with the aim of increasing awareness and protecting all Australians from fraud and scams. The first week of the campaign focuses on Seduction - the too good to be true type of scams, eg. promises of easy money, lottery wins, prizes or true love. The second week focuses on Deception - identity fraud type scams, eg. phishing and other forms of scams seeking to obtain people's personal information. So, during Fraud Fortnight make sure you visit Scamwatch, the government's consumer fraud prevention portal, to make sure you know how to recognise and avoid fraud and scams.